We know you'll love our Kitchen Scissors in the kitchen-and elsewhere too! 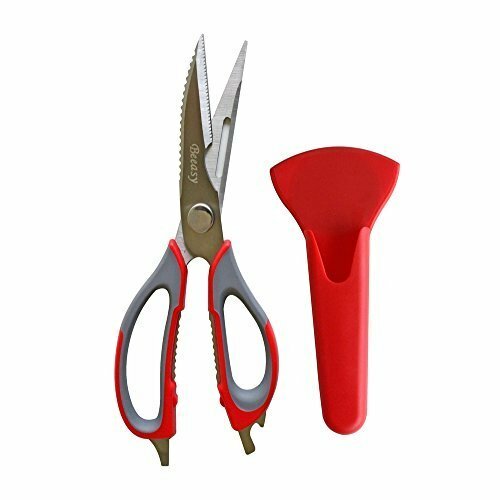 Because of their multiple uses, the Beeasy Kitchen Scissors are handy on camping trips, fishing trips, during backyard barbecues and on picnics. 100 % SATISFACTION GUARANTEED: We want you will love the scissors, If for any reason you don´t like it, you can return them for a full refund or a replacement. Please Add to Cart , You will get it soon. [High Quality] - Premium stainless steel, no rust. Razor sharp blades, be careful. [Comfortable Grip]- Rubberized non-slip and ergonomic handles, comfortable grip. [Easy to Clear] - 7 in 1 Kitchen shears that come apart for easily clearning ,dishwasher safe. If you have any questions about this product by Beeasy, contact us by completing and submitting the form below. If you are looking for a specif part number, please include it with your message.